Amelia Earhart, a Kansas girl, discovers the thrill of aviation at age 23, and within 12 years has progressed to winning the Distinguished Flying Cross for being the first woman to pilot a plane solo across the Atlantic Ocean. 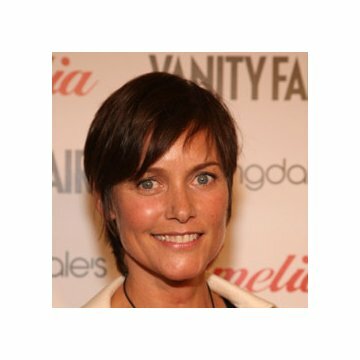 At age 39, she sets out on an attempt to circumnavigate the globe, an adventure that catapults her into aviation myth. Taglines: Visionary. Lover. Dreamer. Fighter. Legend. Icon. Gene Vidal (played by Ewan McGregor), who was widely assumed to have had a romantic relationship with Amelia Earhart as depicted in this movie, had only one child, Gore Vidal (played by William Cuddy). Gore eventually grew up to become quite a celebrity himself as a controversial but successful author, screenwriter and political activist. 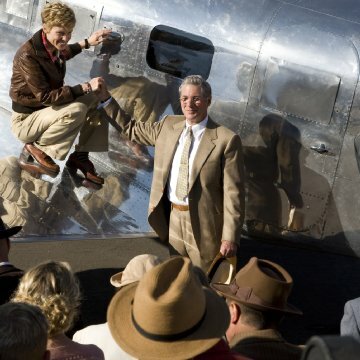 Continuity: When Amelia Earhart and Fred Noonan talk in the Papua New Guinea hut, a woman leaves the bar, then reappears in the same spot a few seconds later. Amelia Earhart: Who wants a life imprisoned in safety? I was very disappointed with this movie. It's an honest statement and I am prepared to explain why. This film had so much on its side. Excellent actors, a fascinating subject, in fact the whole thing reeked of Oscar-Worthy... until it actually showed up in theaters. Perhaps it really did try, and I can tell that it was MEANT to be an awards movie. It couldn't be further from worthy. 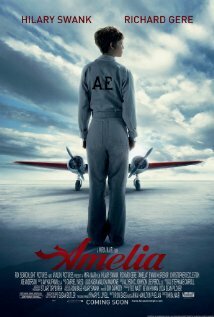 "Amelia" is a highlights reel of Amelia Earhart's life, faithfully chronicling all the significant events of the famed aviatrix's career. However, it is hollow and nowhere is this more apparent than in the depiction of Earhart's relationships. Or the lack of it. There's no buildup, no exposition, no sort of character interaction to motivate any kind of bond or love forming between individuals. Things just kind of... HAPPEN. Amelia falls in love, falls out of love, and falls in love all over again, all without any sort of event or prompt to motivate it. In fact, that's the problem of the entire film. Things just HAPPEN with little or not buildup or motivation in between. Poignant moments come and go with no warning or conclusion, rendering them meaningless and out of context. It seems almost as though the director Mira Nair tried a little too hard in the wrong direction. This is a biopic, not a biography. Plenty of biographies have been written about Ms. Earhart already, the facts belong there. This is supposed to be a movie, and whereas I have no quarrel with facts, they are not the most important aspects. Movies are supposed to be snapshots, truer to the SPIRIT of a character and the MESSAGE of a story than the events within. Events in and of themselves are hollow and meaningless unless the MOTIVATIONS behind them are explained. 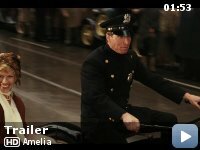 In "Amelia", they sadly are not, and we are relegated to seeing the brilliant moments of Amelia's life pass with emotionless detachment. Why? Because this movie makes no effort in building character, assuming that the actors' charisma and the fame of their names would automatically make us invested in their fates. Ms. Nair, you were mistaken.